Networking has its own language. On top of that, there are a lot of acronyms. If you can't speak and understand the language, you won't get anywhere. Networking used to be an exotic technical area that only specialists saw. But today most everyone is on the Internet. Learn the names, and things will get easier. Yes, this is an academic model that always appears when networking comes up. But it's useful! Here, in written form, is how I explain in about 15 minutes all you need to know about networking for an introductory cybersecurity course. The OSI model, or at least the important parts of it, helps people to quickly understand the different tasks that networking must perform simultaneously. The protocols are defined by documents called RFCs. Those documents can be found at rfc-editor.org and tools.ietf.org/html. However, those documents include far more than you probably want to know. See my quick overview if you just want a reminder of the headers. Internetworking with TCP/IP, Volume 1, Douglas Comer, Prentice Hall. This is a very readable description of the major components (and many of the minor ones) of the TCP/IP internetworking protocol suite. Comer's book is the best place to start. TCP/IP Illustrated, Volume 1, W. Richard Stevens, Addison-Wesley. A bit tough for an introduction, but a good one to follow Comer's book with lots more details. Comer's book is readable, this is more like an encyclopedia. Managing IP Networks with Cisco Routers, Scott M. Ballew, O'Reilly and Associates. Good advice on IP routing with Cisco. Interconnections: Bridges and Routers, Radia Perlman, Addison-Wesley. Loads of details on routing algorithms and protocols. The Wireshark software package can capture and display network traffic. You might refer to this as "network monitoring", or "packet capture", or "protocol analysis". You might be troubleshooting, or you might be stealing passwords or sensitive data. Protocol analyzers are dangerously powerful tools! Every operating system has its own command-line interface to check and set network parameters. Linux, Windows, macOS, Cisco, they all do it their own way. Learn the command-line networking tools. Many marine vessels now have satellite and a fully functioning network online. Many boat builders like Hatteras Yachts for sale have their own network on board now to be able to control all of the ship's functions right from a cell phone or tablet. Typical racks of network equipment: switches, routers, and WAN interfaces. Modern switched networks are built in a multi-tier architecture. It may be as simple as spine switches at the core and leaf switches for the host connections. A three-tier architecture uses core, distribution (or aggregation), and access switches. The core switches at, well, the core of your network, distribution switches in data centers, and access switches for host connections. 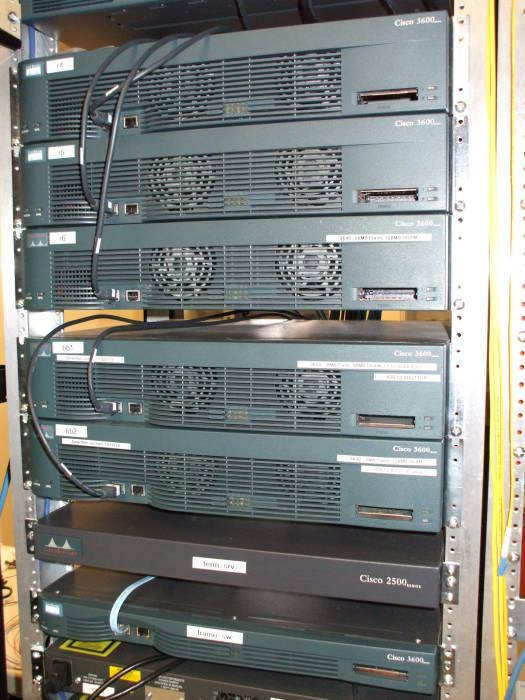 A top-of-rack or TOR model has an access switch in each rack. Not necessarily at the top! All the servers in that rack connect to the TOR switch. It then connects to a distribution switch for a row of racks, which then connects to a core switch. If the inter-switch connections are fibre, the architecture is somewhat "future-proofed" or "upgrade-proofed" — if you upgrade the TOR access switches, it's a simple replacement. An end-of-rack or EOR model connects all the servers in all the racks in that row directly to a distribution switch at the end of the row. The advantage is that there is one less switch in the end-to-end connection, and a little less latency. 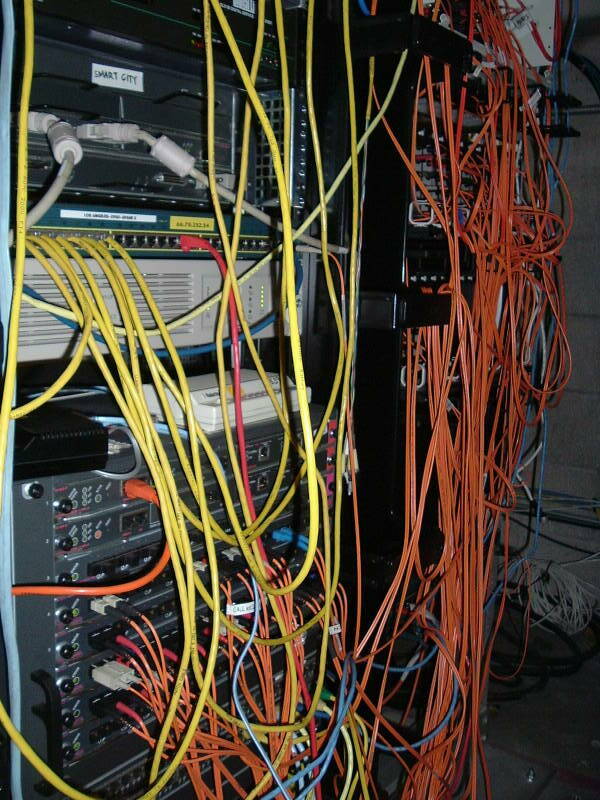 The disadvantage is that the cabling is much more difficult to manage. and only three may have user connections. Modern switched Ethernet LANs are exempt from the 5-4-3 rule because switches have buffers to temporarily store frames and all nodes can access a switched Ethernet LAN simultaneously. I have a page that aims to be a "just enough" explanation of IP addresses, netmasks, and subnets. Another page introduces CIDR and VLSM. My pages are enough to get you started. VLAN or Virtual LAN technology is one of those things that you don't have to use, but once you see what it provides, you will want to. The Internet Assigned Numbers Authority handles global coordination of the DNS root servers and IP address allocation. Then organizations divide up the world by continents. Major ISPs support IPv6, However, I found that the Arris Surfboard cable modem didn't support IPv6 until I made some changes to my system. That cable modem, at least the way it operates on Comcast's network, insists on an unusually small Ethernet maximum frame size. Too small, in fact, for IPv6. There were also some IPv6 routing issues. See my page for the details. Learn how an IP host uses its IP address and netmask along with its routing table to decide how to forward a packet. The logic is part of the IP protocol — if a device runs IP, this is how it does it. See my simple explanation of what IPsec is, what cryptographic security it provides, and a little about how to set it up. It makes sense to use a private IP address space inside an organization. RFC 1918 set aside 10.0.0.0/8, 172.16.0.0/12, and 192.168.0.0/16 as private IPv4 address blocks, and all of fc00::/7 in the IPv6 address space is set aside for Unique Local Addresses, an analogous concept. NAT or Network Address Translation is the magic in an edge router that allows internal clients with private or local IP addresses to connect to external servers. This archive of country IP block lists in CIDR format lets you block traffic or email on a country-by-country basis. The IP2location site has a tool that will build rules to block traffic by country. It supports Cisco ACLs, Linux iptables, Apache .htaccess, and more. DNS LOC is about a DNS resource record to describe geographic location. For some now rather old guidance on geolocation investigation (they suggest seeing what time zone the TELNET service announces! ), see IP2geo and cities.lk.net. See the NSA's US Patent 6,947,978, "Method for Geolocating Logical Network Addresses". It builds a network latency topology map using latency to and between known nodes. Multicast routes packets to all members of a group. All participating hosts receive the data, but only one copy of each packet has to traverse the network. RFC 1112 describes how to do multicast. Anycast, on the other hand, delivers a packet to any single member of the group, you don't care which one. It is used now for things like root and top-level DNS service, and it can be used within an organization for services like DNS and LDAP. Anycast is described in RFC 1546 and RFC 4786. Check the current Internet backbone activity with the Internet Traffic Report. The Internet Traffic Report monitors the flow of data around the world. It then displays a value between zero and 100. Higher values indicate faster and more reliable connections. DNS is the crucial component that makes the Internet useful for humans. It lets us use names that make sense to us: www.chem.purdue.edu is probably a web server, within the Department of Chemistry, at Purdue, which is a University. But unless you're familiar with that university's networks, the IP address 128.210.30.34 wouldn't mean anything to you. Most organizations use the BIND software package to provide DNS service. You can get BIND at isc.org. Other great DNS and BIND documents are at isc.org and Team Cymru's Secure BIND Template. IANA maintains the list of all the assigned TCP/UDP port numbers. The file /etc/services on everything except Windows, and something like C:\Win*\Sys*\drivers\etc\services on Windows, contains a partial list. For the complete answer, see IANA's list. The netstat command provides loads of information on a machine's network communications. Listening TCP ports, currently active sockets, etc. It's available under Linux, Unix, Apple OS X, and Windows, but the precise format of the output varies between operating systems. We don't really use SSL any more, it should be nothing but TLS or Transport Layer Security, but we're all in the habit of saying "SSL". Learn how it works, and how to use it correctly and safely. SDN or Software-Defined Networking allows hosts to request data flows with specific quality of service, latency, throughput, security, and other parameters. The OpenFlow project develops open-source infrastructure. Major industry players have their own versions, including Cisco's ACI, VMware's vSphere, and Microsoft's Hyper-V.
Just What Is A "Daemon", Anyway? According to the Oxford English Dictionary, it is "an attendant, ministering, or indwelling spirit." Socrates wrote of his daemon as his inner spirit. The designers of daemons in Linux/Unix (a concept later ported to most other operating systems) intended this meaning, as pointed out in some manual pages. It's an uncommon word these days, we usually use the Arabic djinn, these days often spelled genie, when we're talking about what used to be called a daemon in the Middle Ages.